Pre-heat oven to 220°C/425°F. 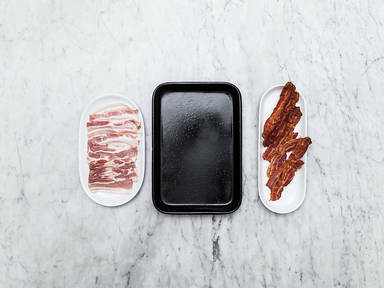 Lay bacon slices on a parchment-lined baking sheet. They should not overlap. Bake at 220°C/425°F for approx. 8 – 12 min. until crispy. Drain on a paper towel-lined plate. Enjoy!